Think of your favorite science fiction book, television show, or movie. 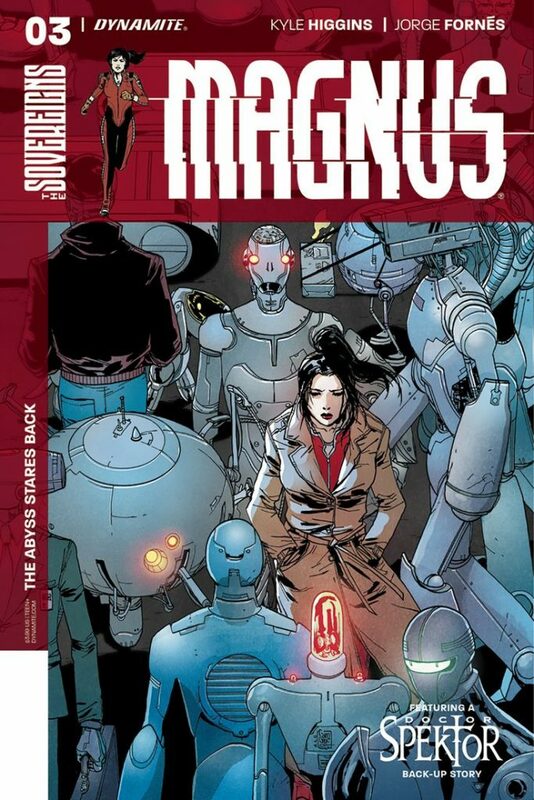 Now make some room for your favorite science fiction comic book with Dynamite's reinvented 'Magnus' series by Kyle Higgins, Jorge Fornes, and Chris O'Halloran. World-building is a term reviewers use a lot to describe the scope of an entirely new environment a writer and artist use to set their story in. In the case of 'Magnus,' there's not just one world to build but two. Our near-future world where androids with AI are at our disposal to use as domestic help and the digital world those same androids escape to. It's the perfect setting for a murderous android who straddles both worlds to be on the run from justice. Luckily, Kerri Magnus also traverses these same worlds as a former bounty hunter and as a shrink for robots, she knows how they think. Kerri is a no-nonsense and tenacious detective, a Clarice Starling for the robotic age. What stands out is how Higgins wades through the mud, the dark seedy side of this futuristic world instead of extolling its virtues. Because it's not too far in the future, it's only 2020, the hateful way that distrust can fester and infect the public by painting a whole population of beings, androids in this case, as dangerous because of one deadly incident mirrors real life right now. For the androids, apart from earning more time in the Cloud, a world of their own making, illegal upgrades give birth to a black market that mutually benefits humans, namely Larry Mooney. The trail to find Frederick, the killer robot, leads Kerri to an old acquaintance from the Cloud, Larry. He may hold the key to Frederick's whereabouts but Larry has to be nudged to give it up. This entire sequence is a masterclass in hard-boiled detective interrogation and manipulation. The dialogue is so fluid and rhythmic and soaked in crime noir. It's smart, tense, and wickedly choreographed. Kerri manages to bridge both the real world and the Cloud to get what she wants and it's riveting to watch. Jorge Fornes is a formidable talent. If ever there was an artist paired with a writer and a genre that speaks to his strengths this is the pinnacle of such a collaboration. Fornes captures such detail and wide-ranging perspectives on each page that it's a cornucopia of innovation and imagination. The scene that will stick with readers is the sequence of jumps and somersaults across elevators Kerri does to infiltrate the building that houses Larry. It's a splash page that demands your attention and keeps you glued to the page. Fornes uses video screens, news footage, negative space, silhouettes, and up to 16 panels on a single page to keep wrapped around his finger. He uses every tool in his toolbox and 'Magnus' is better for it. Of course, such dynamic pages requires a colorist who understands the tone and pace of the story. Chris O'Halloran continues to impress with sharp and smart color choices. Most of the story takes place in darker spaces, full of black, blue, and purple. The lighter shades come from inside the Cloud where it's bright but given the lava lamp treatment in a sky of yellow and green. Where color plays an important contrast is in a gun fight near the end. The sudden blast of colors highlight the action intuitively. I don't give letterers enough credit but Taylor Esposito does yeoman's work here with the varied captions, dialogue boxes from both humans and androids that help give these characters their personality. Taylor has his work cut out for him but really helps to keep the reader engaged. 'Magnus' is a magnificent literary feat that captures the imagination, transports the reader, and tells a riveting crime story as good as any novel or television show. My make-or-break point with a new series comes at the third or fourth issue. 'Magnus' #3 so deftly moves the plot along that you not only get important details but get more than you bargained for in the end. This is an easy "make" for this criminally underrated comic. If you want something to sink your teeth into, something that mixes 'Blade Runner' with 'The Matrix' but feels totally original then this is the one for you.